Free printable St. James Parish, LA topographic maps, GPS coordinates, photos, & more for popular landmarks in St. James Parish including South Vacherie, Gramercy, and Lutcher. St. James Parish, Louisiana covers an area of approximately 238 square miles with a geographic center of 30.02215140°(N), -90.77716573°(W). These are the far north, south, east, and west coordinates of St. James Parish, Louisiana, comprising a rectangle that encapsulates it. Please note that not all coordinates inside this rectangle will fall inside of St. James Parish, Louisiana, as it (most likely) doesn't fill up the entire rectangle. According to data gathered by the Shuttle Radar Topography Mission. The lowest elevation in St. James Parish is -40	meters (-131 feet). This ranks St. James Parish	10th in terms of lowest elevations when compared to a total of 64 counties in Louisiana. St. James Parish's highest elevation is 57 meters (187 feet) which ranks it 47th in terms of highest elevations when compared to a total of 64 counties in Louisiana. The USGS (U.S. Geological Survey) publishes a set of the most commonly used topographic maps of the U.S. called US Topo that are separated into rectangular quadrants that are printed at 22.75"x29" or larger. 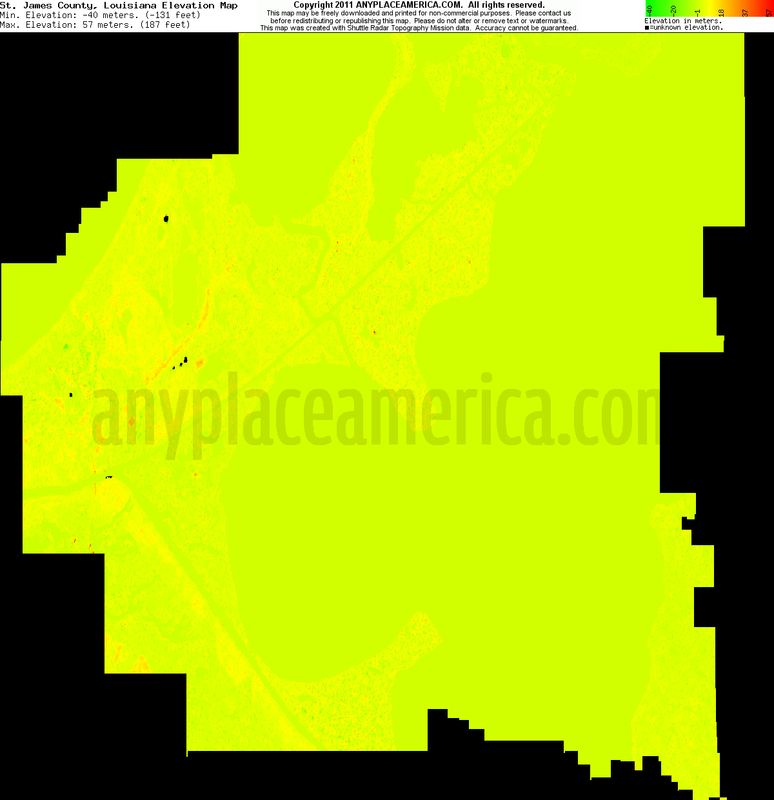 St. James Parish is covered by the following US Topo Map quadrants. Browse the listing of the top geological and geographic features in St. James Parish.